Melody Mendis. 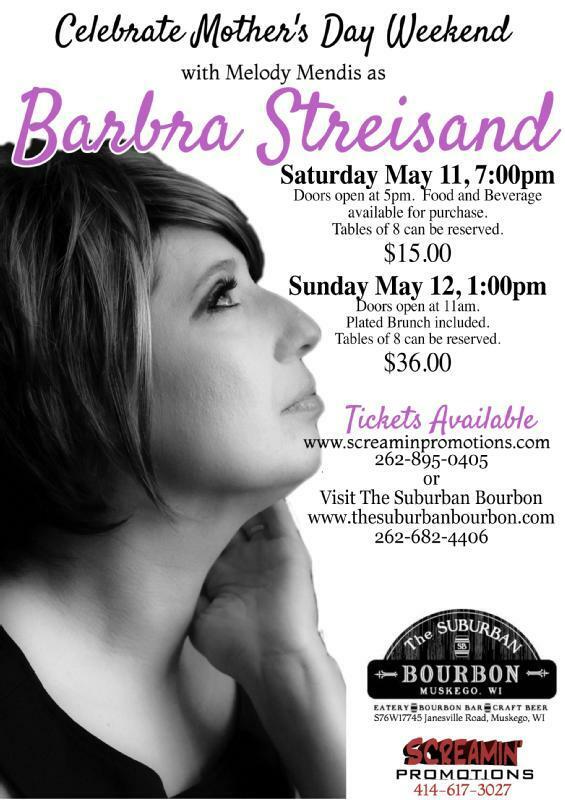 the Midwest's favorite Barbra Steisand tribute artist, returns to The Suburban Bourbon for a special tribute show. Doors open at 5:00pm, food and beverage available for purchase. Tickets are $15 each and reserved tables of eight are $120. Reserved table placement is determined by purchase date and time. Second annual Mother's Day Brunch with Barbra Streisand! This show includes a plated brunch (menu TBA) and the Barbra Streisand show featuring Melody Mendis from Minneapolis, Minnesota, the premier Barbra Steisand tribute artist in the Midwest. Tickets to the brunch and show are $36 each and may be purchased online or at The Suburban Bourbon. The doors open at 11am with brunch served and the two-hour show starts at 1pm. Reserved tables of eight or more are available for $288. Table placement is assigned in order purchased.